← Oh, the people you meet while under house arrest! Once upon a time, when I lived in Georgia . . . I meet and become friends with a fellow teacher named Jay who teaches at a school near my home. Jay is married with three children. No, no, no, it’s not that kind of story. Sheesh, people. Anyway . . .
Jay and his wife create a huge, successful, organic garden for their family. The garden produces many different vegetables including several heirloom varieties. Fig, pear, and apple trees flourish on a southern slope of the property. At the far side of the lawn, rows of muscadine vines and blueberry plants put forth luscious fruit. A pony and a flock of chickens supply manure for the compost pile. In support of these agricultural endeavors, Jay takes up beekeeping. The photos have nothing to do with the story. Pay attention. Hmm . . . where were we . . .
Jay joins the local chapter of the Beekeepers Association. He wants to learn how to tend his hives and how to harvest the honey. It turns out to be an enjoyable social outlet, hanging out with fellow apiarists at the monthly meetings. Right away he and the president of the local chapter of beekeepers become friends. The president is also married and has a wife named — Oh, you’re not going to believe this, but it’s true . . . The wife’s name is Honey. Really. On her birth certificate. And that’s a true story. . . . Okay, so it’s not such a great story. It beats reading about me fussing on and on about the cold and the wind, which, by the way, is getting very old. The fussing, the cold, and the wind. Not only do you make noise, you’re ugly! I did not sleep much last night for all the howling. Plus the plastic range vent which I never use clacked and rattled all night long. If it weren’t so dang cold, windy, and dark outside, I might have run out there and ripped the thing off the side of the BLT with my bare hands. Spike, being nearly deaf, slept like a stone. Bridget, of course, has to keep tabs on me at all times, so she didn’t get much sleep either. Today she and I lounge around inside to make up for the sleep loss, while Spike makes numerous trips outside. The poor guy has to get rid of his energy, no matter what the weather conditions. He also thinks it’s his responsibility to patrol the area, going from RV to RV in a wide-ranging perimeter around our campsite. Then he comes in shivering and stands in front of the heater. A short time later, out he goes again. He’s dedicated to his work, ya’ gotta’ give him that. Gosh, I love that boy. 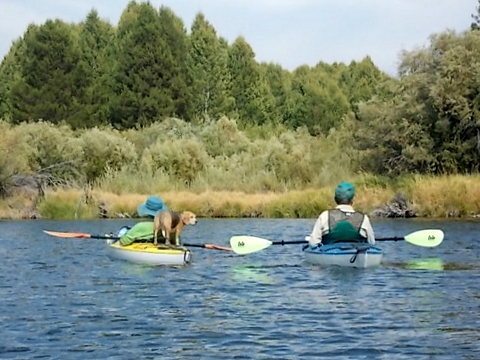 They’re the fun pair I kayaked with on the Williamson River last September. (The Williamson is north of Klamath Falls, Oregon). 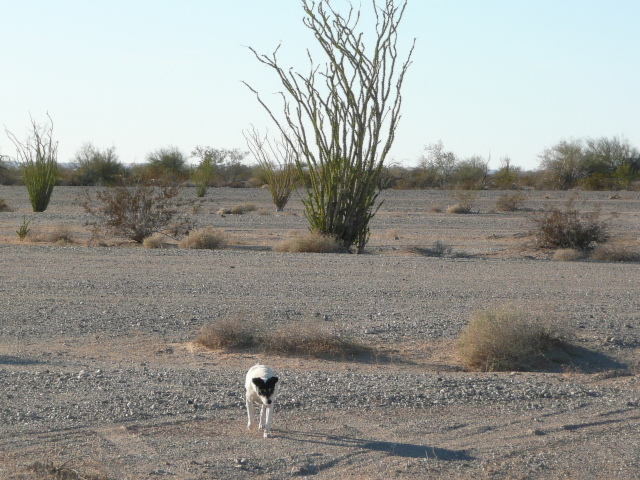 Right now Bill and Ann and their two canines are also in the Yuma area, camped at Fortuna Pond. We’ve been emailing back and forth for two days about getting together. Trouble is we can’t figure out how to get together when none of us wants to go outside. Warmer weather is on its way . . .
Why this pic? Because I love my Wilson antenna! At least that’s what the weather forecasters say. I hope they’ve got it right this time. When the wind calms and the temperatures rise, I’ll pull up stakes, and the crew and I will motor on down the road to a new camp! This entry was posted in Simple living and tagged apiarists, beekeepers, bees, boondocking, dispersed camping, Fortuna Pond, kayaking, organic gardening, rat terriers, RVing, RVs, travel trailer, Williamson River, Wilson antenna, Yuma. Bookmark the permalink. Hi, Maureen . . . I should’ve duct taped it for tonight. It’s dark now and no wind. Maybe we’ll make it through the night without rattles. Sue, if you duct-tape it you might have a time removing the residue when you want to use it again, and it can discolor the plastic when a cleaner such as ‘Goof Off’ is used. WD40 is easier on the plastic, but may leave a discoloration also. You might want to consider simply wadding up a bit of tissue and pushing it into the gap. The tension should hold it in place. This way you can easily remove it when you like.. Funny, if I’d read the rest of the replies I’d have seen a similar suggestion…lesson learned (guess I’m not too old after all). I’m with you…….enough of the dang cold!!!!!! I have to say I have gotten a lot of sewing done. Almost done with the redecorating. More green and less brown, guess I want more spring and less winter in my home on wheels. Stay warm and give the kids a big hug. 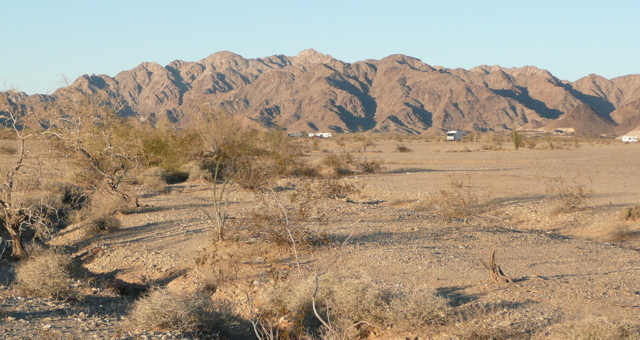 The warm weather is on its way to Ajo, too, Pat! We’re actually supposed to warm up here in T or C. Last nite 14, hi today 38 or so but warming into 50s by Fri. Geri slowly getting better, I’m about done with the bronchitis. Stay warm n healthy you 3!!!! -I wonder if it would be worth it to find one of those old-fashioned, pull-chain-open/closed vents on an old RV or travel trailer (from a vehicle “graveyard”) and have yours replaced? I see they make new ones, too. Keeps the opening sealed except when you need it …. shouldn’t be affected by the wind. Of course, I have no idea if it would be any better. Just something more to spend $$$ on …. I suppose. I have so many projects on my to-do list that I don’t know if I’ll ever get to that. If it becomes a recurring problem, I may have to do something so I appreciate the links. I adjusted the little clips, hoping that will help. Hi Sue…in the middle of an ice storm here. School has been cancelled for tomorrow and I plan to take full advantage of my unexpected windfall. A good day to practice at my retirement life. Cold in the 50s!!! I would love some 50s. Actually, we did just have a couple of days that hovered around there. Thank goodness since it finally melted the ice that was still on my driveway since just after Christmas. Just in time for a fresh snow storm tonight. Ha! You’ve given me some perspective on this weather . . . It is cold and rainy here. We will have about a half inch of ice by morning. It was 70 Saturday and 29 Sunday. everyone sick. but our news said that the flu bug likes warm dry conditions best, so to use a humidifier or a pan of water heating inside to help with keeping flu at bay. It’s working for us so far. Love your story. Hope his wife wasn’t the jealous type. I can just picture both of their faces. Maybe instead of writing a travel book you should write a book of fiction, or truth. My sister Pauline and her family are in northeast Mississippi (south of Corinth). I guess they probably are in for some ice, too. Stay off the roads… you know that. I hope you can stave off the flu with your humidifier. Now I have a reason to appreciate the condensation on the windows when I heat up my morning coffee. Honey…………….I’m home! Sorry……….I just had to! Spike actually looks tired…..on patrol! He may have been scouting out some rotissere chicken and came up empty. There should be two plastic do hickeys on the outside that you can turn to secure the flap closed. Looks like you’ve got them secured in the picture. We always kept ours secured…unless we were using the stove fan. If it still rattles….duct tape will leave that gummy residue…..ball up a couple of paper towels or wedge your sponge/dishrag in it. Just don’t forget it when you pack up. Contrary to Wyoming’s words of wisdom…the wind is NOT your friend. Who names their kid Honey? Oh well . . .
Spike isn’t as spry as he used to be. With his diminished hearing and eyesight, I think he keeps his nose low as it’s a sense that’s still working well for him. I’m glad the BLT/PTV are bright white so he can see his way home, although his nose would probably help him retrace his steps. I secured those clips better. What a life you and the crew are living!!! I, like others, have been reading all the back “issues” along with all the comments…up to May 16, 2012 as of tonight. A few times you have mentioned how the heat hurts the crews paws. Have you ever heard of Bag Balm? It is an animal oinment that’s been made for the last 150 years right here in Lyndonville, VT where I live….I was their Accountant for 7 years before I retired. Bag Balm is the VERY best thing to put on their paws. Truly. Humans use it for EVERYthing as well. If your hands or feet crack in the cold weather and you put Bag Balm on them ovennight…in the morning you will not believe the difference. If you use it on the crew be sure to rub it in and then wipe it off as it will stain and be sure to put socks on if you put it on your feet at night. I use cotton garden gloves on my hands if I put it on them before bed. Super for burns, cuts…as I said everything! It is sold in many Drug stores and pet stores….but not at Walmart (long story on why that is). http://www.bagbalm.com Thank you again RVSue for helping all of us with all the fantastic information (and all you followers of the blog who write in) for us “waiting for the house to sell” and “soon to be on the road folks” like me. I think bag balm is what my friend Ann (mentioned in this post) put on her dog’s paws (That’s Sammy the beagle in the photo) when she (Sammy’s short for Samantha) got cuts on her paws from rough ground. Ann did as you suggest… Put booties on Sammy to keep her from licking. It worked very well and I planned to get some for the crew’s medicine box, but I forgot about it. Thanks for reminding me and also for sharing the information with my blog readers. Many are dog owners. Thanks also for putting a link for us. Bridget and Spike seem to have pretty tough paws. That doesn’t mean they (or I) won’t need that balm some day. Boy, was I lucky to have a buyer waiting for me to put my house on the market. I wish you and everyone else playing the waiting game that you sell soon so you can start your adventures on the road. I forgot to say . . . Congratulations on making it to May on my blog! You’ll be absolutely amazed, I promise you, to read about and see the places the crew and I camped at this past summer and fall! I still shake my head in wonder when I recall . .
Jeeze…I forgot to tell you that you cannot order BagBalm on their website….crazy I know. However, it can be ordered online in a zillion OTHER places. We have been putting the Bag Balm on Samantha for several weeks now, morning and evening. She has not had to wear doggy shoes this year in the desert. There are absolutely no cracks in her paws. I use bag balm when I am working on stained glass projects; it really helps to clear up all the little cuts I get on my fingers and hands. We got our last can of Bag Balm at Walmart I believe. Maybe BiMart in Oregon. A lot of the pharmacies carry it. Corona Bag Balm (in a yellow and red can or tube is almost the same thing). It works just as well as the Bag Balm in a green can. Bag balm is an awesome product! It works well on people, but isn’t ‘approved’ for use on humans by the FDA. I wonder why and haven’t found a similar product that is approved. You are too, too funny. Loved the entire story! Thanks for letting me know you liked the story. Malibu RV Park sounds wonderful… for some people. You’re right. I wouldn’t be able to enjoy that, but I’m glad you are and that you will! The weather is cooperating. Have a great time in the sun . . . Here in Colorado, the wood stove burns day and night to keep the negative 10 temp at bay. The dogs still want their 2 mile walk every day, and guess what, it helps me too. Although when the wind in blowing 15mph or over, I do admit, I don’t take them 2 miles. I’m sure you will soon be in a place with more moderate winter temps. I wonder what kind of a story Spike would write about his solo travels. Negative 10… yuck. You seem to have the right attitude about your weather, out there walking your dogs. Right now I wish I knew what Spike is dreaming about. He “talks” in his sleep. Wouldn’t it be something if we could know the dreams of dogs? Bag Balm my wife was told is no longer being made? Yes she got this answer at three different places of business in Kingman AZ. Is this another grand conspiracy to add to the list? Also we took our stove vent, fan and light off and covered over the vent hole with two led lights for cooking. We cook inside all the time and if we need a vent the Fantastic Fan works well. This simple modification opened our trailer up considerably. We smile like two happy clams now. I was told about someone who did that modification. I wonder if they were talking about you! Or maybe this is a common remodel . 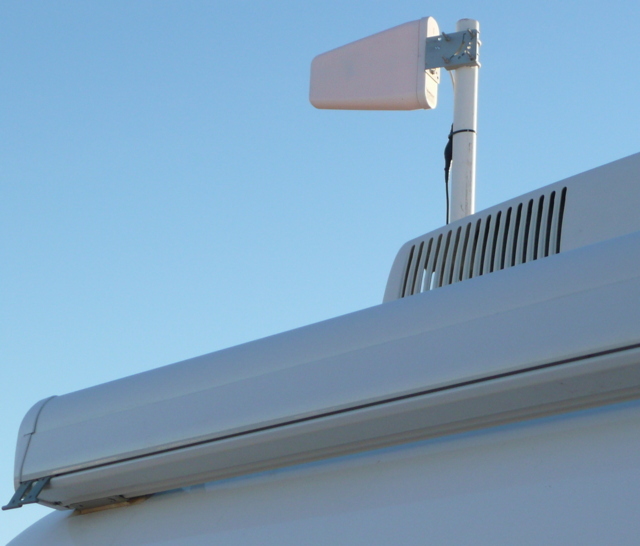 . .
Common mod for the 17′ Casita SD. 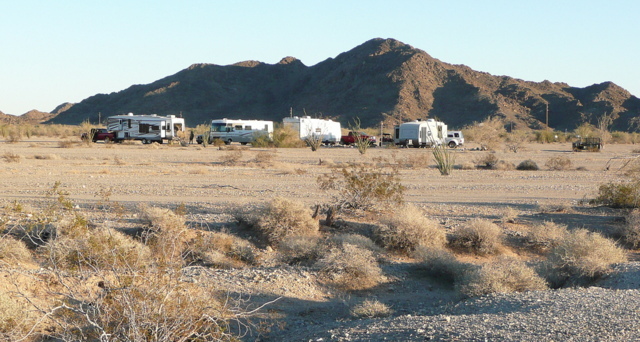 If you go on the Casita Travel Trailer Forum you can see a few examples. Oh we took our vent off this year too and got the vent cover from Little custom. But I lv the LED light setup…I’m off to find it! Sue, Jim and Carol(of Jerry the cat fame) and I both did this on our Liberties with two 12v computer fans and louvers outside. Worked great. We both also had Fantastic fans and I had them in my Oliver andSpirit. You may have seen Jim and Carols at Q’site last year. For the 7 years I worked at BagBalm people called all the time saying that employees at various stores told them it wasn’t being made anymore. It is amazing what employees can come up with when asked a question. I can assure you. and all RVSue’s readers, that it is still being made here in Lyndonville, Vermont. It really is a super product! I almost feel like I know you Rattlesnake Joe as I have been reading all the back issues of RVSue’s blog. You have also taught me alot…Thanks Rattlesnake Joe! Ah shucks mam ‘twert nothin I assure you. One kind follower of Sue’s wrote in to say how it is sold on Amazon, I’ll have to check that out. Thanks for the tip Krystina. By the way I anayize peoples names. Your name tells me you are like a bulldog when you get a notion in your head to do something, you just latch right on and won’t stop until the task is done. A nice trait to have. My wife is very much like that too. You’re also sensitive and stubborn. But heck you know all of this anyway. Rattlesnake Joe ~ Holy Cow!!!! How do you know that?????? Your discription is EXACTLY who I am! Really! You must know something about a Virgos. I am sensitive….like crying during a McDonald’s commercial! Crazy. The spelling of my first name is Norwegian and of course my last name is Irish…YIKEES! Thanks for knowing me although we haven’t met and this is the first time we have “spoken” on RVSue’s blog. Thank you RVSue for this fabulous blog! You’re welcome, Krystina…. I get a kick out of you guys… you and Rattlesnake Joe. No more Bag Balm! Say it isn’t so! I use it on chigger and sand flea bites,which I get a lot of. I think I’m a magnet for them. We, too, are experiencing a cold spell in Mission Texas. Should let up starting Thursday. Loved the beekeepers story. You had me fooled there for a while. Bag Balm is available through Amazon. Hi Rita…Nice to hear you enjoyed the beekeeper story! No warm weather here. Been in the teens durring the day and – 5 to -10 at night. But, I hear that we too are warming up !! we are supposed to get a high of 40 The next couple days and lows 20-25. Yahoo !!!! What are the temps where you are Sue?? You dont have the little weather thingy on your page. Love those working dogs !! I have one too . You stay warm, too, Gabrielle! Nice to hear from you . . .
I’ve used underlying smoothe too. Bag Balm is a better product. Another option is Eucerin cream. I’ve seen it at Tractor Supply….a feed store…didn’t know it was for humans also! I have to comment on interesting names: Our former Pastor’s last name was Pitt and his wife’s name was Cherry. I wonder if she thought about that when they married. Cherry Pitt was a lovely lady. It’s been cold and windy here in Las Vegas too, but supposed to warm up a little by the weekend. I wondered if someone would comment in response to me commenting on the name Honey. I’m glad I didn’t offend you! HAD to go out for propane today. You understand. And when out of the biting wind and in the sunshine I was warmer than inside the RV with the same amount of layers. Out of the wind the sunshine is great. That’s why I don’t like wind. Enlarge the photo and you’ll see that the clips are where they should be to keep it from rattling. The wind was so strong, it rattled anyway. Thanks for trying to help! Hang a clothes pin on the thing–it will keep it from rattling. A long time RVing friend gave me this little trick and we’ve been doing it ever since. Then I’d have to open it enough to put the pin on…. Seems like that would make it worse, something more for the wind to make rattle. This is very strong wind . . . I don’t have a furnace. I had a catalytic heater installed. Tonight is the third time I’ve turned it on this winter for a total of approx. five hours this season. Once it warms up the BLT, I turn it off and close everything up. Up until this week I didn’t use the heater because it was enough to make a cup of hot chocolate or whatever… A few minutes with the burner on takes the chill out. I’ll get back with you tomorrow about the solar diagram. Sue, you can quiet that *#+^ %=! vent by stuffing a plastic bag inside it? You need to keep the flapper in a closed position. Just leave enough sticking out so you can grasp it and pull it out when you want. Cheers from washy state! lock mine down during windy weather. OH, oops, can’t read comments till I actually send a comment first on my cell phone. Quite irritating! Maybe line the corners with a piece of felt before locking down to reduce noise? Sue, about the noisy range vent: from the outside you should be able to see a small latch which when used will secure the vent flap and prevent it from….flapping. 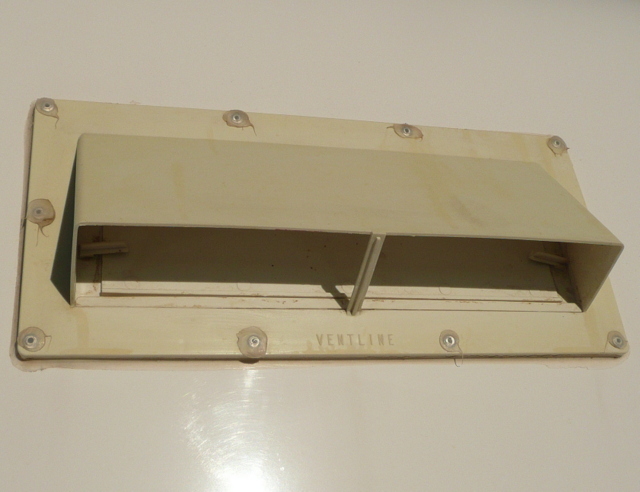 Click on the photo of the vent and you’ll see the two latches are in position to secure the flap. Yup. I would bathtub caulk it shut. I removed ours and covered the hole with a piece of white painted aluminum. Sue, I have a great idea for a new topic if you have a slow news day. You know I am going to retiring to an rv, and am looking at tow vehicles. I know you love your van, but what exactly do you store in your van? I know hanging clothes, tools, battery box, ladder, etc. What else is a major plus of having your van? I’ve had a Jeep Cherokee for years, and I know the space is limited, but I’m researching all ideas. Thanks! Oh I want to know too! No apology necessary…. 🙂 !!! Great story, Sue, and I loved your comment about the “almost” title! Spike has a wonderful job, making sure his girls are safe. He looks very intent on getting her done. Spike takes good care of us! No, of course you didn’t offend me. I figured when my cousin named her daughter, Honey, she better get some thick skin,cause she would certainly get teased about it.